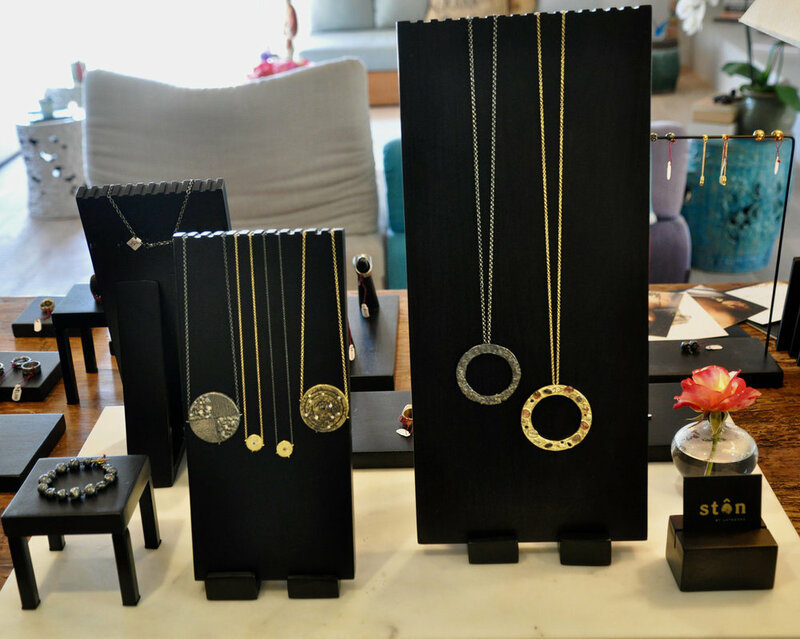 The debut trunk show for stôn took place at the beautiful home of Christine Hallen-Berg in Laguna Beach. Ton and Christine were introduced by their mutual friend Melanie who knew that a collaboration between the two would be a great success. Christine opened her home to welcome the stôn team and guests. Christine is an impeccably gracious hostess whose charm, warmth and great eye for detail and design are embedded within every aspect of her home. Her sun-drenched compound is decorated with wonders from all over the world. Every object and piece of art holds a story within it. The stories of stôn also began to unearth. The atmosphere was that of dear friends coming together to celebrate and support the result of months of hard work. We were able to discuss the inspirations for the designs -- mostly stories about inspiring women -- and witness the bond that is often formed between a client and a piece of jewelry that resonates with them. We loved hearing the stories of these amazing women (and men!) and predict they will inspire our next collection.